If you are looking for a place with good food and kind of a vintage homely ambiance, this is it. 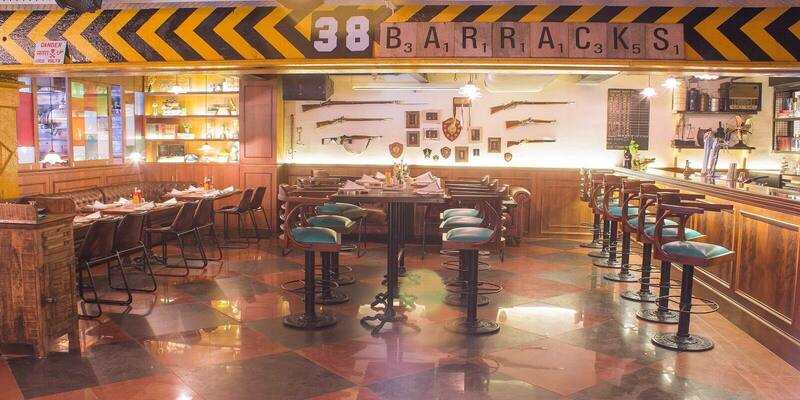 The place will remind you of an army officers residence, with guns adorning the walls and medals and trophies everywhere. There is an outdoor balconey area on the first floor which is great to chill when the weather is right, and live music playing in the corner. The menu boasts of variety and a lot of vegetarian options, which is an added bonus. The place gets really crowded, like all others in CP during weekends, so table reservations are highly recommended. Overall a very offbeat and different theme, definitely worth a visit if you’re tired of the same old club themes and and looking for a change. Gaming has always been a common form of recreation and engagement. While the semblance and guise have changed drastically, the fabric still remains unchanged, the need to engage players in to a space that surpasses reality. I remember the change where we went from playing board games like Snakes and Ladders to a “Little Master” video game where you’d plug-in a 64in1 cassette and play Contra, video game parlors buzzing with youngsters playing Street Fighter. Then came the PC which had people playing single player games like Pinball, Solitaire and to the little more advanced Cricket 97, Road Rash, etc. But today, gaming is something very different. With its advanced graphics and HD resolution, consoles and gaming PC’s have changed the face of gaming. Mobile phones are also a perfectly viable gaming platform now. We can practically carry the games we love thanks to our smartphones and laptops. With the easy availability of smartphones, with computing power in the hands of the people, the gaming industry is becoming one of the fastest growing industries in the country. Furthermore, users do not mind paying for a game on the app stores for an uninterrupted experience. Courtesy of the internet, gaming is not geographically bound anymore. One can play with or against another person sitting at the other end of the world. A recent KPMG-FICCI study forecasts the Indian gaming market to reach Rs 4200 crores by 2017. I believe that this number will only increase with time, as our lifestyle changes and technology advances. Now, as then, gamers are ever-present, just that the platforms have evolved.